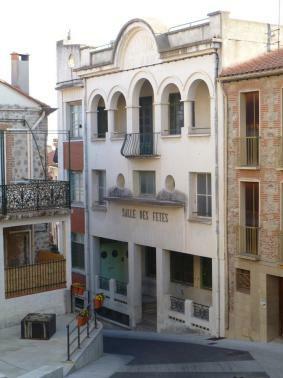 At the bottom of the 'Côte de la Place' there is a building with the inscription « Salle des Fêtes ». Today it is no longer used, but formerly it housed the Town Hall and the village school. The concert hall interior balcony is in the style of the nineteen thirties. Opposite the old town hall is a building, where originally there was a mill belonging to the Malzach family (an important family of Laroque). It was also called the Lord's mill as it had belonged to the Lord of the Castle of Laroque. Later this was the site of the Post Office, which has since been relocated further down the village. Here there was a reservoir which provided water for the Lord's mill. Camille Ferrer was a Catalan water colour painter, native of Laroque-des-Albères. Renowned in the region, he was called the 'painter of the Albères'. His daughter, Maguy Ferrer, is also a water colour artist and her paintings, depicting the Catalan landscape, can be viewed in her gallery at 30 Avenue de la Côte Vermeille. sunday from 09:00am to 12:30am.